There are idiots and then there is the colossally ignorant, self-centered, self-absorbed, beyond stupid and disrespectful … Which one do you think Justin Bieber falls under? During a stopover on his European tour Friday, teen music sensation Justin Bieber visited The Anne Frank House, the Amsterdam museum dedicated to preserving the memory of the 15 year old holocaust victim who died in the Bergen-Belsen Nazi concentration camp in 1945. The self-absorbed Bieber left the following comment in the guest book: “It’s truly inspiring to be able to come here. Anne was a great girl. Hopefully she would have been a belieber.” WTF!!! Just how insensitive and self-centered could this punk possibly be? Where does one even go with the complete disrespect that Bieber showed for Anne Frank, who chronicled her ordeal hiding from the Nazis during World War II in ‘The Diary of Anne Frank’. 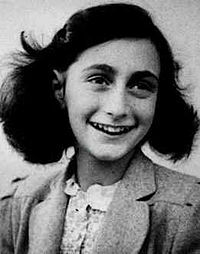 Let us never forget the difference between Anne Frank and Justin Bieber, Frank is a hero, Bieber is a ZERO! Seriously, what kind of a shallow individual says such a thing? Was Bieber channeling his inner Joran Van der Sloot? This is narcissism at its worst. As reported at the WAPO, Justin Bieber on Anne Frank: It is even worse than you think. It is a sad commentary on the youth today and especially the out of touch, spoiled rotten young punk celebrities. Could there be two complete polar opposites than Anne Frank and Justin Bieber? Read the quote below and ask yourself who is the individual you would want your child listening to. I wonder how long Bieber would have lasted in a Nazi prison camp and whether he would have had the strength and conviction of Anne Frank? I think we all know the answer. The sad reality of it all is prior to even going to the house of Anne Frank, this clueless punk probably had no idea who she was. What’s Justin Bieber’s dream? To be famous, for being Justin Bieber. What’s inside him to express, besides a tremendous misoverestimation of his own worth?